An engaged group of 30 sailors or more gathered at Lough Derg Yacht Club on Saturday for ICRA's annual conference and agm that included a line up of talks as well as the presentation of the ICRA Boat of the Year Award, a sailors forum where discussion was heard about next year's national championships at the Royal St. George Yacht Club as well as ongoing refinements to ECHO handicaps. Below is a non-exhaustive overview of the day's proceedings under outgoing ICRA Commodore Simon McGibney. Former RORC Commodore Michael Boyd, who was elected Chair of IRC Rating Congress last month, gave an excellent overview of where RORC is going. The London club is getting more involved with inshore thanks to the Royal Corinthian hook up and also working with ORC on the Worlds where a single Irish boat competed this year in The Hague. The combined World Championships was interesting and bought up a number of areas for further development. It remains unclear if IRC and ORC can ever merge but both are cooperating much better. Boyd's overview presented IRC as an inclusive rule, with more emphasis on integrating different types of technology, versus the more traditional pure protection of the existing fleet. Prof O'Connell of North Sails Ireland gave an entertaining talk using highlights from the on the water sessions NS have done this year. Graham Curran and Mark Mansfield of UK Sailmakers Ireland ran through some highlights from their Afloat.ie series this year (here), with a focus on setting up the boat and rig correctly. Rory Carbery outlined the ongoing relationship between Irish Sailing and ICRA. It was highlighted that the cruiser/racer fleet and the ICRA Nationals event contains a number of common designs. In future, ICRA to give these a focus and work with these owner groups to grow numbers and event attendance. Howth Yacht Club's experience with under 25 sailors was highlighted as something that is working. Pathways within cruiser racing ("how do ICRA create owners and keep them engaged") discussed. ICRA has initiatives for IS Training to Crew through the Under 25 effort and Competent Crew to Race Crew through the training grant. Other pathways for consideration include Friend Get Friend, Adult Training transition, engagement of Experience Seekers, Crew to Owner, White Sails to Spinnaker. There were six under 25 teams at this years J24 Nationals. Projects are going strong at HYC, RCYC and clubs in the west. At least one Dun Laoghaire club is looking to set up a team. Successful events run nationally but ICRA can do more. There is budget available, come and get it. Should ICRA increase the limit? ICRA open to proposals about €1000 on a case by case basis. Should ICRA provide training to boats without an ECHO/IRC cert? Possibly but this funding is coming from cert fees so that contribution needs to be recognised in terms fo where funding goes. Nearly all boats above 1.040 now focusing on coastal and offshore. This is not seen as a threat to ICRA, more people doing the cruiser racing that is right for them and offshore meets many of ICRA's objectives. ICRA to continue to work in collaboration on developing all parts of cruiser racing as a whole. Sailors forum at the ICRA conference covered a range of topics and the following suggestions/observations were made. The Boat of the Year (BoTY) Trophy should be changed to a points series based on existing national and regional cruiser racing events. BoTY points to translate into penalties on Standard ECHO, to help ECHO address the issue ICRA is having at major events with ECHO and IRC prizes going to the same boat. More work is needed by ICRA to improve support for ECHO at a local level. To give people more confidence in terms of who they will be racing against when entering an event ICRA will adopt a range of classes based on the design of cruiser/racer commonly sailed and narrow rating bands. Divisions will be formed for an event by combining these classes. Overall prizes will be awarded for the division. Day prizes will be awarded for each class. The makeup of racing at the nationals was discussed. Should ICRA move to all windward/leeward with a single longer race making better use of the fixed marks available at most venues? It was felt that ICRA should stick with the current mix of laid windward/leeward and fixed mark courses as it offers the best opportunity for all boats to compete equally. No crew weight limits to be continued. Current no crew limits make people uncomfortable in the context of a nationals but reasons for doing this also recognised. New wording using the crew number on the cert but with no limits for crew under 18 and additional numbers if sailing with women to be drafted for further discussion. Issues with group 3 limitations preventing participation thanks to the catch-all nature of WS regulations. WS looking at reducing the age to 22 and including anyone doing any coaching would make this worse. ICRA should trial no group 3 limits for IRC and a complete ban on group 3 for ECHO for next season and review. Equipment inspection: ICRA should introduce equipment inspection at the nationals. Today's international annual meeting of the international IRC Rating Congress in Dun Laoghaire will appoint Royal Irish Yacht Club sailor Michael Boyd as its new Chairman. IRC rating representatives from Belgium, Canada, France, Britain, Hong Kong, Japan, Holland, Turkey the USA and Ireland are meeting at the Royal Marine Hotel in Dun Laoghaire to deal with a lengthy agenda under outgoing Chair Peter Wykeham-Martin of the UK. The meeting will receive, consider and decide proposals for IRC Rule changes for 2018. It will also receive reports from the combined IRC/ORC The Hague Offshore Sailing Championships. Also on the agenda is a presentation to the international group by ISORA's Peter Ryan. The gathering will attend a special dinner at the Royal Irish Yacht Club in Dun Laoghaire this evening. Former Round Ireland Race Champion, Boyd previously served as Commodore of the Royal Ocean Racing Club (RORC). Will Irish Cruiser-Racing Find Fresh Vitality in the RC35 Class? The great Danish sailor Paul Elvstrom famously commented that it was much easier to create a completely new racing boat with top class potential than it was to create a successful Class Association with global reach to give proper support to its subsequent development writes W M Nixon. Elvstrom was not only a sailor of a talent that was at genius level. He was a designer, boat-builder, sailmaker and marine innovator of the highest order, with multiple Olympic Gold Medals and World Championships in his CV. And from time to time, he would bring out a new prototype of the highest quality. Yet seldom did these new boats achieve universal popularity with the ultimate accolade of having an enthusiastic and mostly owner-run international class association. These thoughts were prompted, in a roundabout way, by consideration of this weekend’s Irish J/109 Nationals at Howth, in which local superstar Storm (Pat Kelly HYC, who’s also of Rush SC) is the defending champion, his crew of Fingal friends – usually augmented by Marty O’Leary - having won a scorcher of a 2017 Nationals at the Royal Irish YC last October. But in other places, Storm is renowned as the Celtic Cup winner of the relatively new RC35 class. For one of the most interesting things about the J/109 in the Irish scene - and particularly the Dublin Bay context – is that she’s all things to all men and women. Certainly, there are national class associations in several countries and an international association in order to keep the class as One-Design as possible. And in the Dublin Bay group, there are clearly defined crewing rules which prevent boats with the significant professional input of a Category 3 sailor in their crew from taking part in the J/109 Irish Nationals. But nevertheless, flexibility is the keynote of the general approach. Despite the attraction of one-design or semi-one-design racing, the National Championship is one of the few events in which the class in the Greater Dublin area sails specifically as the J/109 Class. Most of the owners are Dublin Bay Sailing Club stalwarts, and they realise that their class of 15 or so Grand Prix boats make up a significant segment of the upper part of the many and various DBSC cruiser-racer fleet. This fleet’s turnouts on a Thursday evening are worthy of a detailed sociological study, as many of the crews include people whose only sailing is this one race on a Thursday night, and it has been that way for years. But that’s a kite for flying yet again at another time. What is relevant is that the J/109 owners realize that if they hived themselves off as a separate class, it would greatly weaken the turnouts in the open divisions. So they prefer to race with their differing IRC ratings as individual boats against each other, and also against boats of other types. It’s a flexible and mutually-beneficial arrangement which suits the reality of the times we live in. If they were racing as a white-hot and separate One Design class, they’d be under pressure week after week to have a crack crew ready and willing to go, whereas, in the more comfortable space of one of the cruiser-racer divisions, they cut you a bit of slack if frequent turnouts become too onerous. At least, that’s the way it seems to outsiders. But certainly there’s a different mood to the class when the Irish Nationals are the weekend’s agenda, as they satisfy the need for competitive idealists who dream of a large J/109 one-design class racing week-in, week-out and continually going neck-and-neck in Dublin Bay, whereas realists appreciate that a middle course in class administration produces the most beneficial outcomes. In achieving this, they work on the J/109’s multi-functional abilities. In a non-One Design context, they were the Boat of Choice in the Beaufort Cup series, the cornerstone of the biennial Cork Week. And the overall winner was John Maybury’s J/109 Joker 2, sailed by Commandant Barry Byrne who, back in June, had also won the Corinthian Division in the Round Ireland Race in the same boat, another feather in the J/109 cap. Then in August some of the J/109s found themselves in Calves Week in West Cork, and after the racing programme was over, owners and their families happily discovered that the J/109 really can be a very effective and comfortable cruiser. As for the hard-raced Storm, her interests abroad went the opposite way, to the northeast. The Kelly crew have long been successful participants in the Scottish Series in late May, and in 2017 they found themselves involved in a developing Scottish initiative, the RC35 class. Sailing in Scotland doesn’t have quite the same rich vein of One Design history which continues to inform much of Dublin Bay racing, and nor does it have the same total single focus which Dun Laoghaire Harbour provides south of the River Liffey, thereby providing continuous interaction among boat-owners. But in recent years, when the Scottish fleets have got together to race, shrewd and observant participants have noticed that the sport among boats around the 35ft level seemed to have generated its own special popularity, with a sense of community and a high level of competition to match, encouraged by the fact that all boats finished within a reasonably similar time frame. This was so abundantly evident at 2016’s Scottish Series that by May 2017, folk like John Stamp, Christine Murray, Kevin Aitken and Craig Latimer had hoisted the flag – with the support of Harken and other sponsors - for a new RC35 class for all boats in a tight IRC rating band between 1.015 and 1.040, but with more flexibility on overall length – your pride-and-joy can be anything from 32ft to 38ft in overall length. Like many successful organisational ideas, it wasn’t revolutionary – rather, it rationalised an existing situation to give it a much more attractive and user-friendly structure. Suddenly, lone owners with boats like Beneteau First 36.7s, First 35s, Archambault 35s, Corby 33s, and several Elans and X Boats, found that they were being brought in from the cold to become part of a real warm class with a nascent class association, run by owners for owners with a growing sense of camaraderie. And they’d their own developing programme, where the really keen could commit to the entire season, while others knew they’d have good racing with a welcome guaranteed even if they went to only one regatta. The J/109s fit very neatly indeed into the lower sector of that tight RC 35 rating band, so by 2017’s Scottish Series, the Irish J/109s found that the IRC 2 Class had also become the RC35 Class, and it fitted them like a glove. Then, by the 2018 Scottish Series, IRC 2 was no more. It was now clearly named the RC35 Class. And the new setup was the best show in town, with the Irish making hay and Storm winning overall by four points from John Hall’s J/109 Something Else from the National YC. The closest of class racing for three different bow profiles, as they’re all in RC35. For Storm, it marked the conclusion of a remarkable month in Scotland which made the Kelly family the Afloat.ie “Sailors of the Month” for May 2018, as they’d been so taken with the RC35 concept from their experience in 2017 that they took part (needless to say with success) in the class in racing at the early May Bank Holiday, and Kip Regatta at mid-month before going on to Tarbert and the Scottish Series. Then they hastened home for the new Wave Regatta at Howth and though in the J/109s they had to concede first overall to Andrew Algeo and partners in Juggerknot, Storm won the tradition Lambay Race around which the Wave Regatta is centred. For a Fingal boat, the 164-boat Lambay Race in itself is every bit as important as the Wave Regatta overall. Pre-start jockeying for the RC35s at Bangor Town Regatta on Belfast Lough in July. Meanwhile, up on Belfast Lough the concept of the RC 35 Class had come across the North Channel to be one of the building blocks for the multi-class Bangor Town Regatta in the extended first weekend of July, a new twist on an ancient event jointly organised by Royal Ulster YC and Ballyholme YC. In the end, the relevant class was called IRC 2, but it was the RC35s by any other name, and this time it was a Scottish boat, the Elan 380 Animal (Debbie Aitken) which won, albeit by only one point from Storm in the regatta’s hottest classes. Back home in Howth in late July, the Kelly family’s efforts were re-directed towards helping tonner Half Tonner Harmony (Johnny Swann) prepare for the Half Ton Classics in Belgium in August, as young David Kelly – Pat’s grandson – is a member of the Harmony crew. Apart from showing the camaraderie of sailing, it was something which underlined the significant difference between Howth’s hyper-keen Half Tonners (we hear the class is soon to have an interesting new addition) and RC35s like the J/109. For the Half Tonners are a manageable road-trailing proposition, but the J/109s and other RC 35s are too big for most owners to consider the road journey as an integral part of campaigning. In other words, the RC35 has the potential to flourish when its various centres are within reasonable sailing distance of each other, and this is why its initial area of growth is along the Firth of Clyde with out-reach to the East Coast of Ireland and North Wales, with the different main events being given an overall structure through the season-long Celtic Cup Trophy. For 2018, this was decisively taken by Storm after she added to her earlier success in the Clyde and Belfast Lough by winning the Welsh IRC Championship off Pwllheli and Abersoch in breezy conditions in August. The RC35 Class gets to Wales in August 2018 – ISORA Champion 2017 (and 2018), the J/109 Mojito (Vicky Cox & Peter Dunlop), finds herself drawn into the RC35 class in close contention with Scottish visitor Triple Elf (Christine Murray). This weekend’s National Championship in Howth is, of course, an exclusively J/109 event, but for next year the RC35 Class are keen to make the Dun Laoghaire Regatta 2019 one of their pillar events. There were preliminary moves back in 2017, but for 2019 all the signs are that the RC35s are going to give the VDLR 2019 the full welly if all the balances between class divisions can be resolved. Making the cut in rating bands for major cruiser-racer events is now almost a spectator sport. But there’s no doubting that the enthusiastic adherents of the diverse new RC35 class have brought a sense of cohesion, camaraderie and sheer fun in sailing to the sometimes seemingly sedate world of cruiser-racing. This is a truly grassroots movement – there’s no way it’s a stultified top-down organisation. We might say that the market has spoken, and the producers (aka Event Organisers) have to listen. The Irish Cruiser Racing Association (ICRA) has announced dates and venues for the ICRA National Championships in 2019 and 2020 plus details of its end of year Annual Conference and AGM. For 2019 the ICRA National Championships will be held in Dublin Bay, hosted by the Royal St George Yacht Club. Allowing time for a tune-up during the domestic spring series or in Scotland for the Kip Regatta and Scottish Series, the Nationals will kick-start an Irish season on the 7th – 9th June, followed by a number of high profile events such as the Dun Laoghaire to Dingle Race (that sets sails on June 12), Sovereigns Cup (from June 26th to 29th) and Dun Laoghaire Regatta (11th to 14th July). In 2020 the Royal Cork Yacht Club holds its 300th anniversary of the founding of the Royal Cork or the Royal Cork's Tricentenary celebrations. To celebrate this significant milestone the 2020 ICRA National Championships will be held in conjunction with Cork Week in July of that year. The annual conference will be held in Lough Derg sailing Club on Saturday the 3rd November. (See more information on the conference below). fleet in each region and club and a review of the calendar of events of interest to cruiser racers over the next 6 years. The desire for ICRA moving forward to partner with a major event when holding the National Championships on the South Coast, coupled with the desire to support the 300th anniversary of the founding of the Royal Cork or the Royal Cork's Tricentenary celebrations, led to the decision taken to endorse the event being held in in conjunction with Cork Week 2020. As such, it was important to the committee that the event is held as a standalone event in Dublin next year, and as such the committee also endorsed that the RstGYC would hold the event in 2019. A full review of the calendar was undertaken by the committee and the RstGYC, again to ensure that members wishes were reflected that had expressed a desire for a return to date earlier in the year. A suitable date was agreed as the 7th – 9th June 2019, in order not to clash with other events, and to allow people to take part in the National Championships, before setting off for possible Dun Laoghaire to Dingle race or to Sovereigns Week in Kinsale. A properly managed race-winning cruiser-racer talks to us. And we, in turn, think in terms of “a well-presented boat” writes W M Nixon. But there’s much more to it than stylish presentation. It’s not enough just to look good. 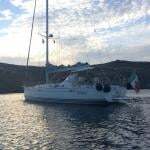 Everything – but everything – needs to be immaculately maintained and working properly, while an almost-automatic rota of timely sail and rigging replacement, together with general maintenance, is always underway in the background. And all that’s before you get into the complexities of putting together the optimum crew, mainly of amateurs, and planning the most rewarding season’s programme within all the relevant factors and the time available. It’s personnel management and human resources utilisation of a high order. It’s a living three-dimensional jigsaw puzzle of teamwork and personal effort, with changing and developing relationships of genuine friendship on a vehicle which in turn seems like a living thing in her interaction with the sea. And as a Wild Card to make the magic six, we have Harmony (Humphreys Classic Half Tonner, Jonny Swan, HYC). When we conclude by telling the Harmony story, you’ll see why her preparation and campaigning are in a special One Boat League of its own. But we begin with the Checkmate narrative, as it was communication with new Half Ton Classics Champion Dave Cullen at the weekend, when they were in the midst of their journey home from international success in Belgium, which spurred this collection of reviews. Only twelve days earlier, I’d been admiring the very complete package which was the campaign-ready Checkmate XV, set up at HYC to depart by road and ferry for Belgium. Yet here they were two Sundays later, well on their way home with the job done and dusted, the big cup on board, and the man himself doing the driving as the complete Checkmate equipe swept through the mountains of Wales on her way to the Holyhead-Dublin ferry. “A few random thoughts on how Checkmate XV operates each year. Basically, I try to be an organised person (some might say I’ve OCD), and underlying it all is the fact that I like to have things planned well in advance. The first thing we do after each race is do a written job list for immediate attention, and then for work over the winter. Once this winter work list is done, I order what is necessary and book in immediately with Alan Power of specialist boatworks Power Marine in Malahide, who does amazing work for us and has never let us down with delivery schedules and special technical challenges. I am always amused when visiting Alan hearing stories of people contacting him in March looking to have jobs done for April launches. They key here is planning ahead and I can get the boat done at the end of season to take stresses off him and us. I am fortunate to have storage at work for the boat, sails, etc, and we (the crew) do the more fiddly jobs here ourselves over the winter. It is important to have the boat looking well with critical elements like halyards, standing rigging, etc serviced or inspected by the experts, as given the cost of campaigns, a broken halyard can cost a series. We sail Checkmate XV with antifouling, so launch her with rough finish to harden, lifting a few weeks later to get sanded to race finish. The cheapest boat speed improvement is hull finish, and we get ours to mirror finish with pure elbow grease. Given time is precious to me, we have a “Nipper” to look after the boat throughout the season. Jonny Sargent gets a fee to look after the boat on a weekly basis, and we have an essential To Do list, the most basic being periodic empty of the dehumidifier, while the boats is always kept clean above and below decks for racing, and stripped weekly of all the stuff that accumulates like 22 bottles of sun cream, 4,000 bottles of warm water, etc.. I say that with tongue in cheek, but it’s amazing the numbers of kilos that do find their way aboard really easily. There is a huge amount of lifting, launching and work days, so I have to give great credit to my long term bestie Aidan Beggan who mucks in hugely and also sails on the boat. (Ed’s note: Dave & Aidan won the Howth Aqua Two-Handed race in July with Checkmate XV). As Checkmate XV is an event boat, I have a towing jeep and purpose trailer. I never underestimate the attention these require as a plan can go up in smoke if either fail. The jeep gets a full service in advance of any long trip and I have the trailer fully serviced (Indespension service yacht trailers) once the boat is launched, and both give peace of mind. Similarly, we are longer than a 40 foot artic truck, so ferry bookings are generally made in January to ensure a place aboard if going abroad. The trailer is loaded with service kit to replace wheels, straps, etc and tool box with relevant equipment. We similarly look at what is required to legally tow through a country and get the relevant equipment/permits. I do the driving as it’s difficult if you’re not used to it, but do check your licence is good for towing. Many lost their towing licence when renewing to the newer plastic one, and you have to be tested to regain. I also bring the boat to a weighbridge to check if trailer is below the legal 3,500kg when I change boats, and I am now just on border. We plan the journeys that take the least amount of road driving where possible, but are prepared if time’s available to make the trips enjoyable by stopping overnight if there’s somewhere nice to stay and eat, even if it takes an extra day. Our horsepower is delivered by North Sails, so at the end of each season, we chat through options for replacements and redesign. Sails are also ordered to avail of max discounts. This is always an issue so at the end of season, we have a get together and I also circulate an email with a draft set of potential events asking crew to indicate potential availability and interest. This is very important to enable people to book family holidays, etc. Once we have a draft plan, we circulate and people can start making arrangements. We have a panel of crew normally, and usually everyone wants to do the main events, so we have to be a bit cruel at times. At this stage of our continual relationship, the guys know it’s not personal if they are cut. For the Half Ton Cup, at latish notice, we were short a main trimmer, so the search went out for someone that can trim the main but - equally important - could fit in socially. We were really lucky that Darragh O’Connor could join us, and he fitted like a glove from our first night (I mean day) out…. Another consideration is if using a Pro, they need loads of advance notice, so Nin O’Leary was secured at the Half Ton Cup 2017 for 2018….. Our Half Ton Crew consisted of myself on helm, Nin O’Leary as tactician, Darragh O’Connor on mainsheet, Franz Rothschild on genoa trim, Aidan Beggan on kite trim, Jonny Sargent in pit, and Niki Potterton on the bow. We are largely a team that have sailed for many years together, so know how each other operates both on the water and ashore. When in regatta mode, we set a sensible curfew each night but do enjoy the socials each night. It’s a different story before and after the regatta. Another big factor is practice and we try when possible to get as much practice as possible, including being first on the race course each day. Finally I also like having crew gear for all. It makes us look and possibly feel a bit more professional and organised plus the photos on the water look a lot better. For each event, we try to hire the biggest house we can (with an entourage of ten) and a chef if necessary. Sleep is an important ingredient so everyone needs a decent bed and food. We screwed up in the recent Half Ton Cup in not bringing enough lunch on the second day. This made people agitated and “hangry”, so less focussed. Being hungry is not helpful but this is important as much as it is important to get people to drink and stay hydrated, particularly in hot weather. We each have separate water bottles to avoid bugs being passed through a crew, which does happen surprisingly easily. Going into this weekend, Chris Power Smith’s J/122 Aurelia from Dun Laoghaire has won her two most recent major races, she had a very good Round Ireland Race 2018 to place third overall, and she positively glows with lots of owner-given TLC. Chris Power Smith is a third generation Chartered Quantity Surveyor who has developed several business interests, and originally his sports were scuba diving in the summer (he was one of the most highly-qualified early scuba divers in Ireland) and hockey in the winter. He got into sailing when a group of friends from both sports recruited him as overall organiser in 1994 when they’d chartered a boat for Antigua Race Week. They were lake sailors with no knowledge of navigation, but he could supply it from his diving background, so immediately his role in the Antigua expedition became more than just travel agent, and he has been hooked on sailing ever since. He worked his way up through crewing with Bruce Lyster on the Sigma 38 Errislannan in Dun Laoghaire, and then personal ownership of a succession of J/Boats. He discovered a new passion for offshore racing when he tried an ISORA event after he’d found Dublin Bay Class 1 racing had become a bit claustrophobic at the extravagant heights of the Celtic Tiger years. By contrast, he reckoned ISORA to be “gentlemanly”. In 2015, after success with a pair of J/109s – “the first one was extremely well used when I bought her, and I mean seriously well used, so after a year or two I bought a brand new one” – he had then bought the J/122 which was to become Aurelia – the “Golden One” – in good second-hand order from France. His first longer offshore race with her was the Dun Laoghaire-Dingle race of 2015, a good debut even if Aurelia was pipped into third place at the finish by the two J/109s Ruth and Mojito. In the Round Ireland of 2016 he was right on line for very significant success until parked in a local calm just north of Rockabill, but if anything this frustration spurred him on to even more committed involvement with the boat, and she has almost always been in the frame since. With a boat the size of a J/122 (she’s big - a 40 footer with a long waterline) you might begin to expect a boat manager arrangement of some sort, but Chris is very much a hands-on do-it-myself-if-at-all-possible person with - as his sailmaker Maurice “The Prof” O’Connell of North puts it - “an incredible capacity for productive attention to detail”. Chris goes beyond meticulous – “preventive maintenance and early replacement” is his mantra, and he is equally careful and thoughtful in assembling his crew: “I’d rather sail a bit short-handed than have someone aboard who is disruptive or counter-productive”. But the short-handed situation seldom arises, as people like sailing with a dedicated, thoughtful and successful skipper, and over the years he has built up a solid crew panel based on his original group of Niall Smyth, Ger Walshe, Lynda McCracken, Duncan Lyster, Jeff Ryan and Stephen Tierney, with the addition, since the step-up to Aurelia, of Bernard McGranahan, Dave McGrew, John McManus, Aileen Kelleher, Francois Pean, Oisin Coffey, and Michael Keatinge with the occasional involvement of John McGonigle, Dave Turner, and Nuala McGranahan. As to the sailing itself, in 2018 as detailed in Afloat.ie he linked in with The Prof to maximise Aurelia’s sail-power and The Prof raced on board for the Round Ireland – “an education in itself in every way”. But Chris himself can have his own clear views on tactics and reckons it was his opinion that successfully kept Aurelia out of the calm-laden bays of Donegal, his motto when calms threaten being: “Never let the ship lose way. If you can see that you’re sailing into a calm patch, take urgent action. If needs be, turn round and sail back – just never, ever lose steerage way”. The biggest boat in our magic half dozen, the Grand Soleil 44 Eleuthera is a 2002-built Judel/Vrolik design which was optimized for racing for the Dutch team in that year’s Commodore’s Cup. Frank and his young crew of mostly Greystones sailors, drawn mainly from dinghy sailing, took her over just as Calves Week 2017 in West Cork got under way, and the experience gained in the final part of that season encouraged them into a work programme with the boat ashore in Greystones during the winter of 2017-2018. With every boat in today’s list, we find that owners and their amateur crew have been willing to provide the elbow grease in preparation which having a successful boat entails. Admittedly the amounts vary with each boat, and not every owner expects a work contribution from his crew. 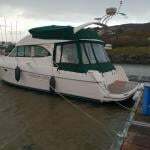 But forget about any ideas of owners airily handing the boat over to some yard at the end of the season with the instructions to have her race-ready and in perfect order on 1st May. On the contrary, hands-on management is the key in all six boats. And as Patrick Barnwell, Frank’s right hand man and key player in recruiting keen young sailors from among the growing membership in Greystones has in effect put it: “There are few group bonding experiences which will be as effective as working together to bring up the finish on the enormous underside of a 44-footer in Greystones on a November night”. Yet the reward comes when the sailing gets under way and Eleuthera is sailing at her proper speed, sailed well by a group of tested friends rather than just campaigned by a work party. Age differences melt away as different physical capacities are most effectively accommodated, and special talents are utilised to the full. At times, it’s sheer hard work – there’s no doubt about the effort the young sailors put into helping their skipper bring his boat into the overall winning slot in Class 0 on the final day of Cork Week. This is teamwork of a high order, the successful team for 2018 – ranging in age from 17 to 60+ - including Frank Whelan on the helm, with Patrick Barnwell, Gary Hicks, Conor Clery, Kevin O’Rourke, Killian Fitzgerald, Andrew Smith, Matt Sherlock, Gavin Laverty and Shane Hughes of North Sails. One of the most interesting things about the boats on this list is that none is new. John Maybury, an engineer with a special interest in such things, reckons we still don’t really know the full possible lifespan of properly manufactured fibreglass construction of whatever type. And he reckons that his hugely-successful J/109 Joker II – which he bought new in 2007 after several seasons with a Sigma 38 – is probably in as good order now after 11 years as she has ever been. But then he is another of those owners who is never happier than when looking after his boat personally. And in tandem with two of his longest-serving crewmates and friends, Jack Mulligan and Brendan Phelan, he shares an encyclopaedic knowledge of how everything in Joker II works down to the finest electronic detail. Over the years with the boat, they’ve kept out of just slipping into a routine annual sailing programme. They’ve done complete Dublin Bay years, but then in other seasons, they’ve devoted themselves with total dedication into offshore racing, with the ISORA programme – overall runners-up in 2012 – and the Round Ireland Race with a second in class. Then when they returned to a more inshore-oriented programme, they included former Olympic helm Mark Mansfield of Cork and UK Sailmakers as tactician, and while John Maybury has continued as helm, Mark’s input as tactician has improved their consistency – three annual ICRA National Championship wins in a row speaks for itself. But equally John is open to other interesting ways of using the boat, and as several of his regular crew – particularly Jack Mulligan – are with or have been in the Defence Forces, negotiations were successfully concluded for Joker 2 to be campaigned with total success by Commandant Barry Byrne and his Defence Forces crew in the inaugural Beaufort Cup series in Cork Week in 2016. This productive relationship was repeated in 2018, but before the Beaufort Cup, Barry Byrne and a Defence Forces crew raced Joker 2 in the Round Ireland Race, placing second overall, winning their class, and winning the Corinthian Prize. This is a narrative which speaks for itself - it speaks volumes for the quality of boat management and a refreshingly healthy attitude to the full possibilities of boat ownership. In the rural depths of the coastal country north of Dublin, where the locals think of themselves as being in Fingal while others simply think of it as being the North County, the Kelly family of Rush have their home. And in the midst of it is a mighty shed which has many functions, and one of them is to provide a winter home and workshop for their hugely successful J/109 Storm. There, Storm receives meticulous refits as a matter of course, and as one awestruck observer has put it, every other winter the Kelly family – three generations of them now actively involved – take their successfully-used boat apart with crewmembers helping, and reassemble her again in perfect working order in the sort of work programme which can only be fully understood by those who know boats inside-out. Then each year they devise an annual programme which always has unusual twists to take advantage of the boat’s race-winning potential while introducing her mostly family crewmembers to new places and people, while at the same time doing enough home fixtures to stay with - and usually ahead of - the Irish pace. Thus in 2018 they spent much of May in Scotland mopping up prizes here and there with a successful conclusion by winning the Scottish Series, but by June they were back in Ireland and while they’d to concede first overall in class to Andrew Algeo et al in the J/109 Joggerknot in the Wave Regatta at Howth, within it they won the Lambay Race, which - for a Fingal boat – is what it’s all about. Came August and they saw the potential of the Welsh IRC Championship at Pwllheli, and took part in the decidedly rugged racing with such success that they came home as the new champions, and the next main item on the agenda will be defending the J/109 Irish Championship won in October 2017. There’s a special family warmth and generosity of sprit around Storm and the Kelly family which is inspiring, and our final listed boat and skipper and their 2018 campaigning were to become beneficiaries of it in a big way. They say that Jonny Swan lives up to his surname - in high- level contests, he can seem to be winging it with some very tight time margins in preparing for his campaigns. But after his successes in 2018, which included being overall winner of the all-comers Harbour Race in Cork Week and coming a good second in the Half Ton Classics in Belgium as well as always being in the frame in other major events, we felt that his boat management style deserved celebration, as he represents an enthusiastic younger generation in the ranks of cruiser-racer owners. “I have sailed competitively since I was a kid, however, I had never put together a crew and campaigned a boat with eight crew before. I sailed with Terry Giles for many years and Terry always put together a great season, so I was well educated by him by the time I bought my first keelboat. I acquired the 1980 Harmony in 2014 from in Sligo. There was a substantial amount of work required to make the boat competitive. As with all wooden boats, there is constant upkeep and in the first year or two, there was a lot of upgrading to be done, with the major work being done by Dougal MacMahon in his classic boat workshop at Belmont in County Offaly, while a new rudder was supplied by John Corby from Cowes. During the season, all the crew do what they can with the inevitable “To Do” maintenance lists, and longtime shipmates Edel Harvey and Eamonn Bourke are especially helpful in this area. These days, in the winter the boat is kept in my husband Frank Rowe's family farm in County Wexford, which keeps her undercover sheltered from the elements. Frank does a lot of the winter maintenance and sails on the boat when he is not running marathons or competing in triathlons and is very supportive of the campaigns. With work and family commitments for all involved, it is very difficult to sail the boat weekly. Usually, myself and Joe Turner meet in January over a few drinks to formulate a plan for the season ahead, and get agreement from the crew which events we intend to do. This year it was agreed to do the Scottish Series in May, Wave Regatta in June, Cork Week in July and the Half Ton Cup in Belgium in August. It takes a substantial amount of commitment and organisation to arrange to get the boat to the starting line of each event, especially when towing the boat to events on the continent. After Cork Week and in the lead up to the 2018 Half Ton Cup in Belgium, she was in need of some TLC and urgent replacement of faulty deck paint, and David Kelly of Storm (son of Pat) said I could drop her up to the famous “Storm Workshop” in Rush and his own son David (who at 17 was the youngest member of Harmony’s crew in Cork) and himself would help me out to do what was needed in advance of the Half Ton Cup. With the Kelly family’s high standards, it became a major refit, with the deck stripped right back and then re-sprayed, and the anti-fouling re-sprayed and re-surfaced too. Three weeks of work every day with marathon work from David Jnr and his family along with the Harmony crew, and the boat was ready four hours before the ferry was due to depart to start the journey to Belgium. When we arrive at an event, all of the crew pull together to get the boat launched and set up. For the event, we are all a team that help each other out as any team player would do. We sail together, socialise together and have a great time. There is never a cross word between us which makes the event a fun and enjoyable occasion. This is a key part to achieving what we are all there to do. While it is my boat and the underlying responsibility for the boat is mine, I believe the boat is the crew’s also, and I hope that every crew member feels this way, because it creates a great team environment which definitely enhances the overall performance. It is important to note that most of the crew take over half their annual leave to participate in events during the year. So it has to be more than anything fun and enjoyable because the crew are making a considerable commitment. I regularly offer the boat to the crew to do any events they want to do when I can’t be there myself, and in 2017, the younger generation did the ICRA Nationals in heavy wind conditions at the RCYC, and they came an excellent 2nd overall helmed by Ryan Glynn. Having bought the boat when I was 33, I have been incredibly lucky and privileged with the quality of crew who have joined and continue to sail on the boat. The boat would not have achieved the results she has done under my ownership without them all. We are simply a great bunch of friends, and always make everyone feel part of the team. The camaraderie of the Harmony team is special, and this is one of the keys to the results we have achieved over the last few years. But no campaign or event can run smoothly without extra support, and there are definitely a few standout people and organisations who have supported our campaigns and events towards success. I made the decision earlier this year to move to North Sails Ireland. Nigel Young and Shane Hughes have been superb. I cannot thank them enough for all they have done, and having Nigel on board in Cork Week and the recent Half Ton Cup in Belgium was a great addition to Harmony. His input contributed to the best result I have achieved out of the four Half-Ton Cups I have competed in, and also a significant result in Cork Week where we won the famous All-Comers Harbour Race by a comfortable 2 minutes from over 90 boats that started on the one start line. Ross McDonald in Ropedock has been an excellent addition to the marine industry. He is helpful and efficient. And there’s Howth Yacht Club and all their support. As for the Kelly family in Rush with all the hard work done to the boat in advance of this year’s event in Belgium and their warmly supportive attitude, that definitely contributed hugely to the overall result. Then there’s Gerry O'Daly, who was part of the crew when we won Dun Laoghaire Week in 2015. Although he lives in Sligo, he’s a superb support with the logistics, and the boat could not do some of the events without his help – if needs be if time is short for everyone else, he gets up at crack of dawn to tow the boat to the various events for us. Lastly and firstly and most importantly - the crew. Without a dedicated crew, the boat cannot begin to be a success, and every one of them has contributed to the results we have achieved - Harmony is privileged to have had every one of them on board”. Following the cancellation of the ICRA Nationals in Galway last Friday and the explanation on the event Facebook page here, the reigning Class One Champion John Maybury, of J109 Joker II, says it is the fact that the Port of Galway is lock–gated, and not the weather, that made a 'complete nonsense' of the Galway Bay event. I’m angry about the cancellation of the Nationals, to say the least. The fundamental issue was the venue and whatever politics were involved in bringing it to Galway in the first place. With the lock gates and priority to commercial shipping traffic, there was no way Galway was going to work for the National Championships. The conditions we got would not have posed much of a problem at any other normal venue, and the championships would have been run. My own objection to Galway in the first place was simply the distance involved in getting there from Dublin Bay. But I took the point about the West Coast boats wanting to 'bring it local', and I decided to make the effort and support the event. I didn’t know about the lock gates until last week. But ICRA knew and went ahead regardless. At best, this was absolutely thoughtless. At worst, it was selfish and arrogant. It is the fact that the Port of Galway is lock gated, and not the weather, which made a complete nonsense of the event. When I called last week to ensure there would be a berth for Joker 2 on her arrival, I was dismayed to find the Port of Galway was gated, with access only for two hours before each HW. On querying that with a member of the Organising Committee, I was told that it would not be a problem for the event as arrangements had been made with the Port to ensure the gate would be open for 3 hours either side of HW during the event and the schedule of racing had been planned accordingly. It turns out that the arrangement with the Port, wasn’t worth the paper it was written on, as the movement of shipping dictated everything. Surely this was a predictable risk for a commercial port, but it doesn’t seem to have been taken into consideration by ICRA in the selection of the venue? The spin being put about is that it was the victim of a Perfect Storm of unlikely events. On the contrary, I think it would have needed all the planets to have aligned for it to have passed off smoothly. They were never going to get that. Knowing the Port as I do now, what happened was entirely predictable. I am sure ICRA were aware of the constraints of the venue. Any objective risk assessment would have ruled it unsuitable for a National Championships. To ignore the risks and carry on regardless was a massive display of arrogance, and shows a complete disregard for the time, expense and effort involved by owners and crew to compete from any distance with anything other than a trailerable boat. I would expect ICRA to carry out an objective post-mortem on all of this. There are painful lessons to be learned and actions to be taken. The decision by ICRA to go to Galway has been demonstrated to have been pure folly. The Galway Bay based Marine Institute has presented competitors in the 54–boat ICRA Cruiser Racer National Championships currently being hosted by Galway Bay Sailing Club with a large A1 sized full colour poster illustrating the seabed imagery of the Bay derived from INFOMAR Mapping, the national seabed mapping programme undertaken jointly by Marine Institute and Geological Survey of Ireland. Galway Bay is one of the first Irish coastal inlets to have been fully mapped by INFOMAR. While the data are primarily used for safe navigation and shipping, they also provide invaluable information for fisheries management, environmental conservation, and strategic development programmes. While as sailors we rely on our admiralty charts, pilot books, and more increasingly on our digital navigation software apps to get us safely around the coast, this modern era of seabed mapping data now enables production of high resolution oceanographic models, and reliably predictive tides and currents. The first race of the ICRA Championships in Galway has been cancelled today due to strong winds on Galway Bay. The 54-boat fleet, moored in Galway Docks, was expecting an early start and as many as four races this morning after Wednesday's opening races of the WIORA championships were also cancelled due to strong winds. The Galway Bay Sailing Club race management team are keeping a close eye on weather forecasts to complete a minimum of three races in order to constitute a championships series by Saturday.